Disclaimer-Apollo Horticulture products are for professional use and are to be used in a green house environment with proper ventilation only. Use of our products in any other environment such as apartments, community housing, or small enclosed spaces is not recommended and may create a potential fire hazard. By purchasing our products, you agree to the recommended use and release all liability of Apollo Horticulture and respective agents for any misuse of the products. 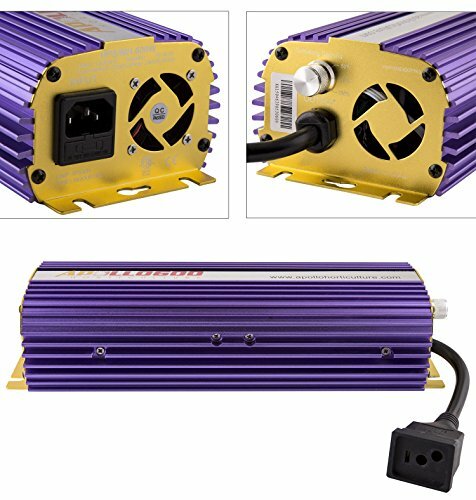 Built in cooling fan and Graduating fin design to minimize ballast temperature, Light weight (Under 10lbs), CE certified and ETL listed. Each Unit Includes a 3 year Warranty. If you have any questions about this product by Apollo Horticulture, contact us by completing and submitting the form below. If you are looking for a specif part number, please include it with your message.